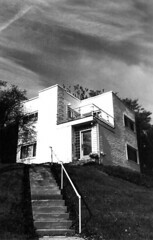 Exterior view of the Deffaa Residence designed by Armstrong in 1937. The cubic brick masonry structure was painted white. Although the house appears to be two stories and positioned up on a hill, it actually has three stories. On the upper level in the southeast corner, there's a terrace located over the main entry. That is one hell of a climb... a knee replacement candidate's nightmare!